Who are the top rated forwards, defensemen and goalies in NHL 13? 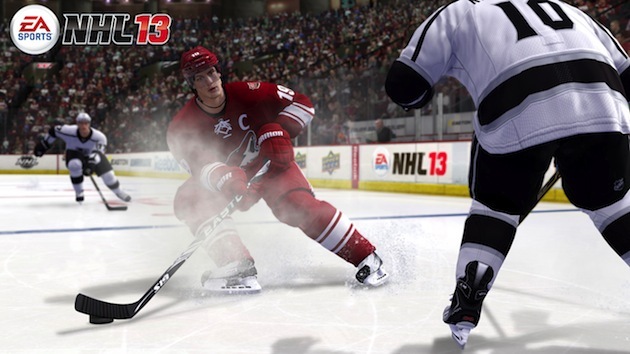 NHL 13 is set to be released by EA Sports in less than a month. On Sept. 11, the 21st installment of the series will hit the shelves featuring better A.I., true performance skating, an overhauled trade logic and game presentation, as well as GM Connected, the online dynasty mode that can bring together as many as 750 people. While we wait for the game to come out, EA has revealed the ratings for the top forwards, defenseman and goaltenders for NHL 13. On Wednesday, we'll have a full ratings reveal, in the meantime, EA has changed the way they decided to rank players. How are the NHL 13 player ratings different from NHL 12? EA: Last year, overall ratings reflected a player's effectiveness based on their player type (ex. Sniper, Enforcer, Grinder, etc.). 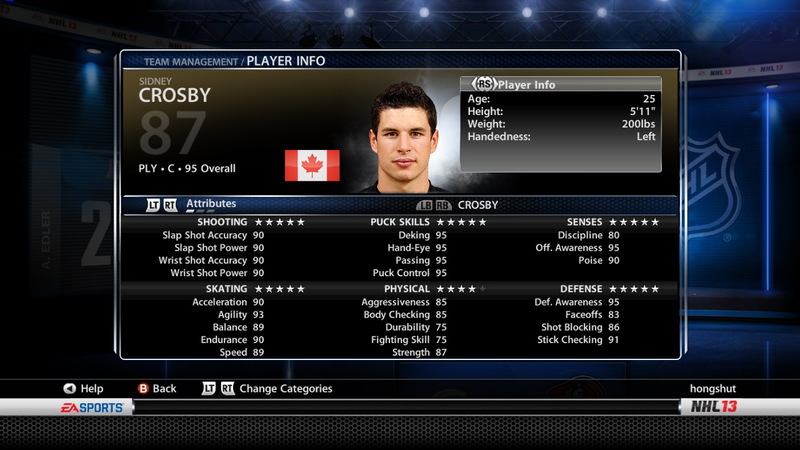 NHL 13 Overall ratings are based on a player's overall skill based on their position. EA: It was a fan-requested change that ensured that overall ratings were more representative of a players skill level in real life. A players who is 90+ will feel drastically different than one who is rated 65. Examples: NHL 12 Parros was an 81 as his rating was based on his player type — enforcer, meaning that he was an above average enforcer. In NHL 13 Parros is an 69 overall based on his skill level as a forward. Chris Neil was an 82 (Grinder) last year, this year he's a 78. With this new overall ratings system, his rating didn't drop as significantly as Parros because he's still a skilled player who can check and score effectively. After the jump, the top forwards, defensemen and goaltenders in NHL 13. Datsyuk (93) and Crosby (94) both get increases from last year thanks to the new way EA has determined ratings. Datsyuk may have a 90 in "Poise", but deserves a 100 in "Dry Humor". Alex Ovechkin (93), Steven Stamkos (91) and Evgeni Malkin (91) round out the top five forwards. Chara retains the 91 rating he had in NHL 12. Shea Weber, Kris Letang and Duncan Keith (90) and Ryan Suter (88) make up the five highest rated blueliners. Miller gets a one point increase from his 91 a year ago. Henrik Lundqvist (91), Jonathan Quick (90), Carey Price (90), Roberto Luongo (89), and Pekka Rinne (89) are your top netminders. Poor Rinne was a finalist for the NHL 13 cover and couldn't even manage to keep his 90 rating or improve upon it from last year. Is there anyone missing from these lists who should have made it? You can check out further updates on the official NHL 13 homepage.